Children in the 21st century experience media in ways that are vastly different from any previous generation. Social networking, user-created content and video games provide a level of interactivity that was unthinkable a generation ago. As a result, educators are rethinking educational practices that have long been taken for granted. Many have come to the conclusion that the answers they're looking for lie in making video game design a central part of the curriculum. Proponents of game design in the classroom say that it promotes students' systems thinking, problem solving and critical analysis skills. Best of all, including game design in the classroom drastically increases student engagement with the material, thus increasing achievement. Interestingly, even the Boy Scouts have taken notice of this trend and now include a Game Design Merit Badge as part of their program. So where can the average classroom teacher turn to include game design in his or her classroom? One popular solution is Gamestar Mechanic. Gamestar Mechanic is a one-stop solution for teachers who see the potential of game design being included in their classroom, but may not know where to begin. Using Gamestar Mechanic is a highly engaging experience for students. It has been named one of the American Association of School Librarians Best Educational Websites of 2012. Best of all, since it is based entirely online, there is nothing to download (other than Adobe Flash). Students' first experience upon signing up for an account is an interactive tutorial. 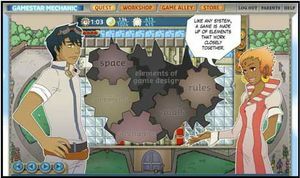 Part comic book and part video game, the tutorial explains the basics of game design by scaffolding example levels for students to play through. Concepts such as the importance of setting goals for your players, having clearly defined rules, and different styles of games are all stressed. Along the way, students will earn Sprites, which will become the basic building blocks of their own games. Sprites are the interactive characters, goals, collectables, items and enemies that you place into your game to engage and challenge the player. Using a simple drag-and-drop interface allows students to focus on the game's design rather than worrying about esoteric programming challenges. With this kind of immersive teaching, students will soon complete enough of the tutorials that they'll earn the ability to create their own games. Eventually they'll even be able to share the games they've created with other Gamestar users. Being able to share games and get feedback from the community is a vital aspect of the Gamestar experience. As a middle school English teacher, I know all too well how common it is to meet students who have difficulty receiving constructive criticism. Often, they will quit on a project at the first sign of imperfection. Teaching children to iterate on their designs, to tweak and tinker until they get it right, is an incredibly valuable lesson. Receiving feedback from other users is an immediate and tangible way of keeping students involved with their creations after they've been posted. This process also allows for Gamestar users to feel connected to something larger than themselves or their classroom; it allows them to be part of a community. After reading a book in class, have your students recreate major scenes in the form of a video game. Ask students to design a game that teaches other students a specific scientific concept you've been studying. After studying ratios, ask students to create a game that contains a certain ratio of coins (for the player to collect) to enemies. Recreate famous myths from different cultures that have been studied in history class. Have students create a game that consists of a level for each stage in a butterfly's life cycle. These are just a few of the countless possibilities. At gamestarmechanic.com/teachers, Gamestar provides teachers with robust support materials. Additionally, Gamestar offers teachers a discount for classrooms, with student registration available at a fraction of the normal cost. In the coming years, our students are only going to become more connected and technologically savvy. I believe that tools like Gamestar Mechanic will give teachers an edge in the battle for their attention; and they will give our students an edge in an ever-evolving future.